Predicate | What Is a Predicate? 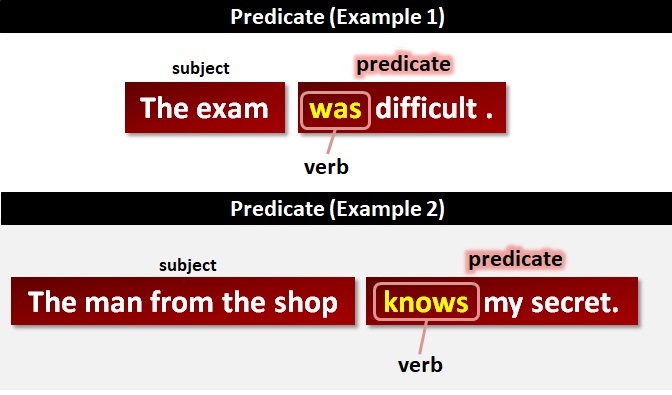 The predicate is the part of a sentence (or clause) that tells us what the subject does or is. To put it another way, the predicate is everything that is not the subject. At the heart of the predicate is a verb. In addition to the verb, a predicate can contain direct objects, indirect objects, and various kinds of phrases. A sentence has two parts: the subject and the predicate. The subject is what the sentence is about, and the predicate is a comment about the subject. Here are some examples of predicates. In each example, the predicate of the sentence is shaded and the verb in the predicate is in bold. A clause contains a subject and predicate too. The examples below are all clauses not sentences. The predicate is shaded and the verb of the clause is in bold. Jane is my youngest sister, who lives with our mother. There is a guy who works down our chip shop who swears he's Elvis. A guy who works down our chip shop who swears he's Elvis is there.